Dimensions 1.25 by 8.50 by 10 in. Mechanics of Materials clearly and thoroughly presents the theory and supports the application of essential mechanics of materials principles. Professor Hibbelerâs concise writing style, countless examples, and stunning four-color photorealistic art program â all shaped by the comments and suggestions of hundreds of reviewers â help readers visualize and master difficult concepts. The Tenth Edition retains the hallmark features synonymous with the Hibbeler franchise, but has been enhanced with the most current information, a fresh new layout, added problem solving, and increased flexibility in the way topics are covered. This title is also available with MasteringEngineering, an online homework, tutorial, and assessment program designed to work with this text to engage students and improve results. Interactive, self-paced tutorials provide individualized coaching to help students stay on track. With a wide range of activities available, students can actively learn, understand, and retain even the most difficult concepts. The text and MasteringEngineering work together to guide students through engineering concepts with a multi-step approach to problems. About: For undergraduate Mechanics of Materials courses in Mechanical, Civil, and Aerospace Engineering departments. About: ALERT:Â Before you purchase, check with your instructor or review your course syllabus to ensure that youÂ select the correct ISBN. 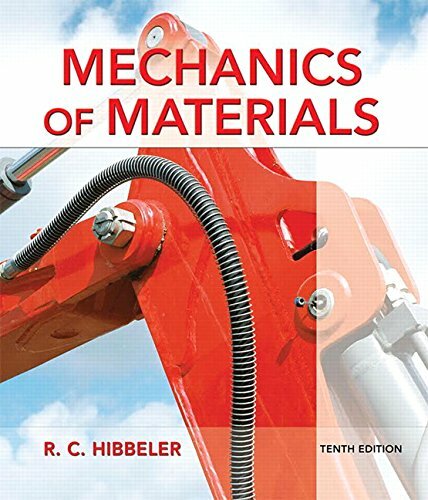 About: This clear, comprehensive presentation discusses both the theory and applications of mechanics of materials.